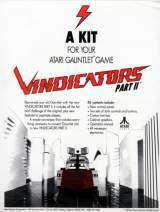 Vindicators Part II © 1989 Atari Games Corp.
Vindicators Part II was released in May 1989. 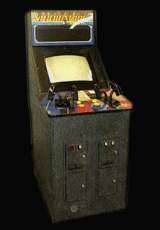 This was sold only as a conversion kit for "Gauntlet". About 400 of these kits were made. * Changes were made to the original weapons. * No T-shirt contest appears nor are there any contest-related items. 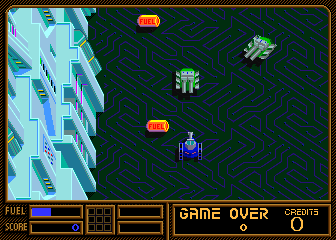 * Only 10 of the 14 original levels are included. Microsoft XBOX 360 [US] (nov.6, 2012) "Midway Arcade Origins"
Sony PlayStation 3 [US] (nov.6, 2012) "Midway Arcade Origins [Model BLUS-31083]"
[EU] Microsoft XBOX 360 (nov.15, 2012) "Midway Arcade Origins"
Sony PlayStation 3 [EU] (nov.15, 2012) "Midway Arcade Origins [Model BLES-01768]"